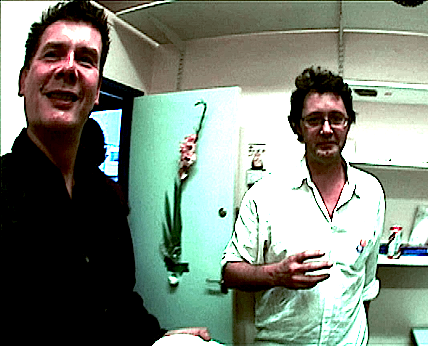 Malcolm Boyle and Carl Stickley have collaborated on various projects related to underground and festival culture. Their film Avalon - A Field In Glastonbury (made for Channel 4 with producer Dom Chambers) captured a corner of the Glastonbury Festival in that Edenic moment in 1999 before the big fence went up and everything changed. Malcolm and Carl met when Carl filmed a performance of Malcolm's one-man biographical show on Syd Barrett; The Madcap at London's ICA. Malcolm returned there the following year to create The Recurring Technicolor Dream - this time bringing in Carl as Event Manager. Since then, their shared aim has been to tell the tale of Hoppy and his scene in a feature documentary. Hoppy - Underground Head is the outcome of that vision. Malcolm has produced documentaries for the likes of Channel 4, Channel 5 and Nickelodeon about subjects ranging from Sacha Baron-Cohen and the World Cup to Spain's Sonar electronic music festival. Malcolm’s critically-acclaimed live show The Madcap - about legendary singer Syd Barrett - toured the UK and featured on BBC Radio 4’s Today programme. Malcolm’s other work includes After Parade and the Barclay’s New Stages Award-winning The Joy Of Return -both produced by live art company Limn Gaza. He directed Graham Duff's one-man show Burroughs! and was the creator, curator and Artistic Director of The Recurring Technicolor Dream – an ICA event celebrating 1967’s 14 Hour Technicolor Dream: Britain’s first psychedelic happening. Carl Stickley was programme consultant on BBC4’s Russell Brand-fronted documentary celebrating Kerouac’s On The Road – an idea Carl originally brought to the BBC. He also collaborated with 60s film director Anthony Stern on Stern's 2008 reworking of Iggy, The Eskimo Girl - a film about the iconic cover star of Syd Barrett's The Madcap Laughs. With a background in broadcast television as one of the founding staff producers of Channel 5, Carl has since gone on to document many significant cultural events relating to the beat, psychedelic and underground scenes. Carl is currently teaching Digital Media at Colchester Institute, Essex, whilst studying for a Film MA at Essex University. He is also working on a film about Carolyn Cassady, based on interviews he recorded with her over a 10 year period.